Nothing is better than preserving that fresh flavour of summer and being able to use delicious local produce in the middle of winter (because let’s be honest, it tastes better). Freezing fruit is very simple and can be easily done, particularly for peaches. If you want to freeze your peaches without skin, blanch them first (note: as they are wet, they will stick more to the parchment). Slice the peaches in half and remove the pit. 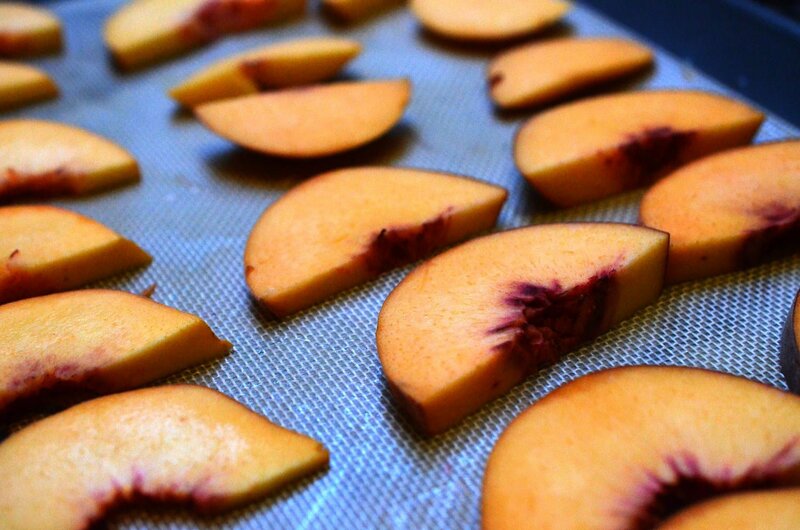 Place the peach face down (ie skin-side up) on your cutting board and slice into medium slices. Very thin slices will be hard to remove from your freezing tray without breaking, so do not cut them too narrow. Place the slices of frozen peaches on a baking tray lined with parchment paper or a non-stick mat. Ensure that the peaches are not touching or they will freeze together. Place in the freezer until mostly frozen, a minimum of a hour in a deep freeze. Lift the parchment paper up and use as a funnel to funnel the frozen peaches into a Ziploc freezer bag. Remove the air from the bag and place back into the freezer. The less air in the bag, the better chance ice will not form and they will not get freezer burn. Try to use within 6 months. Repeat the process with remaining peaches.